Pre-heat the oven to 140°C, then half the tomatoes and cherry tomatoes, and slice the aubergine into disks. Toss it all with sea salt and a drizzle of olive oïl then roast for 1 hour (the aubergine may need turning). Once the vegetables are nearly cooked, roughly chop the onion and garlic and sautée them in a little olive oil until they are cooked through (now is also the time to put your pasta on to cook - it should take 10 minutes). Mash the 4 roasted tomato halves into the saucepan with the onions and garlic, then add 1/2 a cup of water along with the baslsamic vinegar. Add in the aubergine and allow to cook down for a few minutes until the pasta is ready. Once you have drained the cooked pasta, stir it into the saucepan with the sauce, along with the cherry tomatoes, torn basil and a good grind of black pepper . For non-vegans you could now tear up some bits of mozarella and stir it in, so that by the time you have served the pasta, the cheese is melted and delicious. 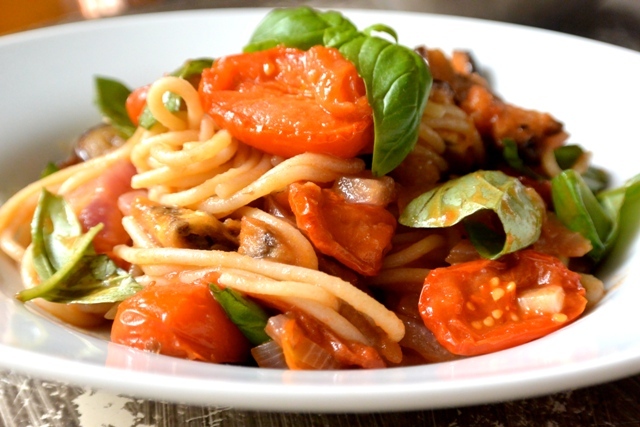 Thanks to Serena from The Herb Diaries for sharing her summer spaghetti recipe.